“My part,” says Voigt in the poem “Milkmaid,” “was laboring through the drifts.” In this particular poem the drifts are snow banks, the speaker a girl helping her father deliver the mail, but it’s that labor, in which the speaker “put something in took something out,” that the speaker both traces and questions throughout the book. 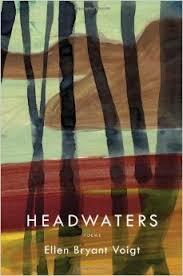 Headwaters: the source of a river, but also the head: this is a book following the current of how a mind moves. Listening to Voigt read these new poems aloud a few months ago, I was struck by the seamlessness of her cadence, and the immediate clarity of what on the page look like wildernesses. Where some poets who write without punctuation might eddy in Frost’s “sound of sense,” Voigt is a full-sun, no-nonsense poet. Curling, yes, “double-stitching,” as she calls the repetitions she uses to help convey syntactical units without the marks of punctuation, yes, but clear water all the way to the bottom. Yet Voigt is not a poet who makes mistakes. Since her first collection, Claiming Kin (1976), Voigt has in more than half a dozen collections put words to—or really, precisely constructed what feel like richly musical core samples of—a largely rural, family-run span of violence, loss, and lyric flight. Poems in this collection often start mid-conversation and end like birdsong, spiraling out. They leave no weight on the branch. What’s fascinating to me about Voigt’s foray into the drift is her delight in directness, her use of drift to actually get somewhere. In “Cow,” this means urging a cow back into a field where a girl is trying with a handful of grass to call the cow “as you would a dog no dice so what/if she recoiled to see me burst from the house with an ax/I held it by the blade I tapped with the handle where the steaks come from/like the one I serve my friend a water sign who likes to lurk/in the plural solitude of Zen retreat.” This is no hippie drift, where the journey is all. This is more like a battle-drift, a Trojan horse. In “Owl,” the owl’s eyes are set in a face that “swivels in each direction like the turret on a tank.” In “Privet Hedge” we see a nuns’ graveyard with “their markers all alike as on a battlefield immense and calm/ beneath an open Midwestern sky nothing between/ the pilgrim and the scoured horizon. Voigt’s attention in this collection is tuned particularly to notions of power and ownership, and to their slippage. In “Stones,” a dying woman’s collection of rocks are seen “shimmering/as if alive rescued from the field the cliff the shore the riverbed I found//a single cufflink.” Just a cufflink, when for a moment we had the whole countryside? This gesture repeats throughout this book: a wild hunger, the lurch for vastness, and then the small raft. Ambition and then the wafer. Later in the poem we again feel the woman’s smallness: “her mind was an etched plate/from which she drew off print after print the framed prints on the walls//were all interiors” and the poem widens again with the nimble question “why/put me in charge,” calling out in wider circles to questions of a mother’s role, a woman’s role, a poet’s role, with the line break separating doubt from command. In the second half of the book, exhilarated by the delightful and fearless ranginess the book’s early poems establish, I at times wanted something even bolder, riskier, something so ambitious there would be tinges of failure: “a large mistake.” Instead Voigt tethers these later poems to social themes of education, the mistreatment of children, and aging, adding to the consequentiality of story rather than letting it melt, as the housebound Icarus in me hoped. But Voigt is a Daedalus, carefully building real wings from scraps, not an Icarus. Voigt’s sense of structure, I would argue, is one of the finest and strongest in contemporary American poetry. Each poem not only leads to the next with startling certainty, but the collection is often pleated too, an image in one poem widening a metaphor four poems back, or reaching ahead to open the latch for an upcoming poem. This is why I’ve reread this book all summer: in pursuit of, and appreciation for, the precise clarity and sustaining balance of Voigt’s collection as a whole. Megan Snyder-Camp‘s first collection, The Forest of Sure Things, won the 2008 Tupelo Press/Crazyhorse First Book Award. Her poems have appeared in the Antioch Review, Field, ZYZZYVA, the Sonora Review, the Cincinnati Review, 88, and on the PBS NewsHour and have twice been nominated for a Pushcart Prize. She lives in Seattle.